Blood Diamond is director Edward Zwick's film about conflict diamonds being mined in Sierra Leone, Africa during the late 1990's and the heartbreaking atrocities that came out of these "blood diamonds". 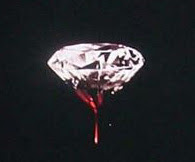 Blood diamonds are diamonds that have been mined for the purpose of purchasing guns or other weapons with them. They then change hands to the smuggler who then sells them to large jewelry corporations thus making it impossible to trace where they came from. This is one powerful film and I'm really surprised that it didn't get nominated for more Oscars (of course in a perfect world, Children Of Men wouldn't have gotten screwed either). The actors all turned in top notch performances especially Leo DiCaprio sporting a think Zimbabwe accent. The film follows a diamond smuggler (DiCaprio) who ends up chasing after a priceless diamond hidden by a now escaped worker of the R.U.F. (Djimon Hounsou). With the help of a female American journalist (Jennifer Connelly) the 2 set out to rescue his son and recover the stone. The film is hard to watch at points because the camera doesn't cut away from a lot of the onscreen horrors (most of which are committed by children no younger than 12 or 13 years old.) Although the war in Sierra Leone is over blood diamonds are still finding their way into the market and this is a rather eye-opening film that gets you thinking what the wedding ring may be costing others halfway around the world.